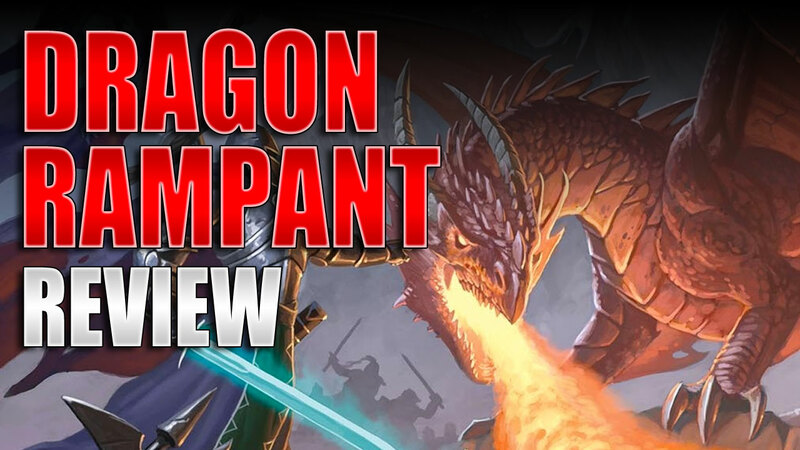 First, I would like to say that this is my honest review of Dragon Rampant and I am in now way being compensated with money or product for this review. 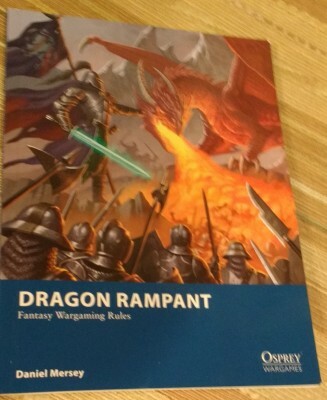 Dragon Rampant is an Osprey Publishing “Blue Book” fantasy miniatures game. Debuting in 2015, the game features a compact ruleset not connected to any miniature lines. An easy read with few pages, and costing around $20, you won’t be breaking your budget. Your wallet will also heave a sigh of relief at the fact that there are no additional codexes or supplements. This is my favorite all around miniatures game for the reasons below. Armies are created on the usual points system. The initial points are always under ten, which makes addition and subtraction easier. Dragon Rampant has a random activation system that uses 2D6. Each unit has a specific number assigned to the action you want them to take. The types are your typical actions: move, shoot, melee. In order to use the unit you have to roll at or above the number assigned to the type. For example, move may be 5+, to go into melee may be 7+, etc. If you wanted to move, you would then have to roll a 5+ to make the unit do what you want. If you fail, the turn goes to your opponent. Each unit can only take one action. If all your units succeeded in their rolls, then the turn goes to the opponent. Moving in Dragon Rampant is fairly straightforward: each unit can move up to X inches and that’s it. You can’t move through some types of terrain and others take 1/2 your move to traverse. Nothing special there either. Each unit has a one inch squad coherency and can’t be less than three inches from another unit. My gaming buddies and I have disregard this rule most of the time. We find it difficult on a small table to keep enough space between the models without them falling off the table. Placing models in the beginning are up to the scenario, but is the mostly just a few inches from the table edges. Attacking involves either 12D6 or 6D6. In melee, the two units roll their dice together. Every unit has a value for shooting or melee, and to score a hit they have to meet or exceed the number on the D6. For example, a unit might have a “5” in melee which means that the unit hits on a “5” or “6.” Shooting is the same, except the opponent doesn’t roll in response. When hit, a unit compares this to an armor value and removes health, called Strength Points. Units that have lost half their Strength Points roll 6D6 instead of the 12D6. The system may be simplistic, but I find the ease of determining health to be a nice compensation. The morale system in Dragon Rampant works by taking the number of Strength Points lost and rolling 2D6 against a pre-determined courage value. This value is unique to each unit, like the numbers described in the turn section above. You take the result of the roll and minus the lost strength points. If the roll is equal or greater than the courage value the unit is unaffected. If the roll fails, the unit is considered broken and has to retreat backwards. If the roll is zero or less the unit is destroyed. Special abilities can be purchased for points. These include things like flying, invisibility, undead, etc. Each ability gives a certain in-game advantage that is self-descriptive. Magic is a special ability as described above, and each spell has an activation number. The mechanics are the same as the the turn section: either it works or the turn passes to the other player. The usual spell types are here: healing, direct attack, give units more courage, etc. The scenarios are also your typical fare in Dragon Rampant. You have the collect the objective markers, kill the leader, and rescue your buddies, among others. More typical fare. If you gotten this far, you’re probably thinking “Why should I play this game? It seems like everything is so ‘typical’?” Well, the beauty of Dragon Rampant is how balanced everything is the streamlined rules. Other fantasy games have units with rules exceptions which admittingly gives them a certain flair. However, the more exceptions you have the more of a possibility there is for abuse. Really, how many times has you favorite game system had to nerf a unit because it had gotten too strong? I have been countless times frustrated because my opponent breaks out some obscure combination and in one turn half my army is back in the box. Since everything is more or less at an equal playing level, being able to min-max is greatly reduced. I feel that when I play the game I either win or lose because I was a good or bad general. I have never felt “cheated” out of a win. Likewise, I actually feel more of sense of victory than a rockin’ list in another game. The downside is that units feel a bit plain Jane at times. Your units will have the exact same stats as your opponent’s same type. The ability to give your units special powers offsets this a bit, but it is nothing like taking a special character in other games. Since the system isn’t based on any line or miniatures, or doesn’t have codexes/army lists, all you need to play are some miniatures of any type and a table. Heck, you don’t even need miniatures — you could use anything to mark your units. Paper cut-outs, thimbles, coins- you name it. 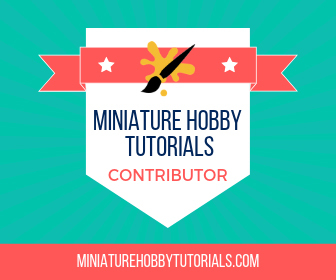 This is advantageous for me because I like to mix and match minis from different companies. The system also breathes new life into your old minis. When you’ve been in this hobby long enough, you’re sure to have some great minis that belong to a discontinued game. Assuming you didn’t hock them on eBay, you can brush off the dust and push them around the table again. Cost is also easy to bear. The book itself will set you back about $20, but you can get it cheaper. As I stated above, I got mine for about 13$. As mentioned above, you can use anything for units, making the miniatures cost go from free to the depth your pockets. In closing I would recommend Dragon Rampant to players of all skill levels. Does it have an expansive mythos, like 40k or Star Wars? No. Can you play it in an hour? Yes. Is it easy enough for beginners yet challenging enough for “pros”? Yes. So, if you’re looking for a lot fluff this isn’t the game for you. If you just want to throw back some tasty beverages and have an easy game with friends this will be right up your alley. Dragon Rampant is an easy to learn game, which can sometimes feel a bit plain, but overall is enjoyable and something I’d recommend checking out. My group have been enjoying a lot of Osprey Publishing books similar to this. The activation test is like Rogue Stars and the use model from your existing collection is a BIG selling point with us. What type of size does Dragon Rampart feel like, AoS or Kings of War? To be honest, I haven’t actually played AOS or Kings of War. 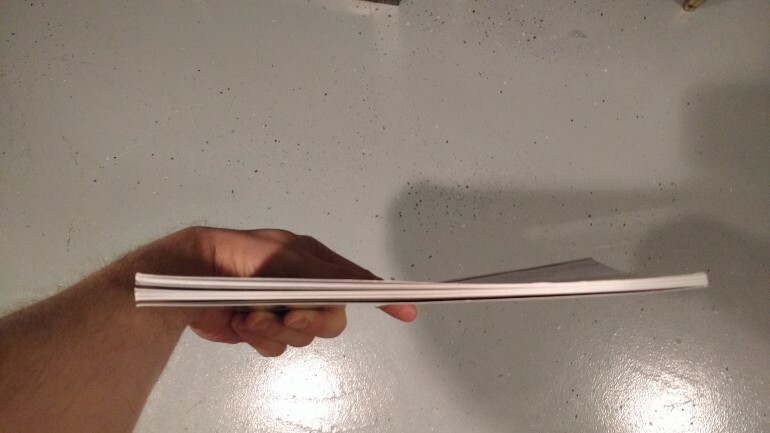 If you’re talking about model size, the book recommends 15 – 28 mm. Another nice thing is that the book encourages single minis or multiple units on a base. Unit sizes can be either a single model or up to 12 minis. The number of minis doesn’t have any bearing on their stats. Again, there is great flexibility in how you want you units to look and feel. Osprey has some real gems hidden in their catalogue. I always thought Dragon Rampant was more a skirmish game, clearly I was wrong! Might have to check it out. Yea, I have agree with that. I can’t say they are perfect, but dang, they are cheap and a ton of fun! He does some good stuff. A Song of Blades and Heroes is my favorite followed by Rogue Stars. I’ve never tried any of the Osprey stuff. In fact, I haven’t played anything that wasn’t by Games Workshop. Yet, for the low cost of buying the book, and the fact you can any use any model, it’s hard to pass that up. At this point I’m all for rules that are a bit more simplified. My days of reading 120 pages of rules are behind me. For a long time I was a straight GW(40K) player too. My biggest hurdle to enjoying new games was ditching the “I go, you go” turns. I thought random unit activation was inferior, but it grew on me. I’m a bit fan of unit activations. The 40K method with player turns is one of my biggest gripes right now. Many games are now won and lost on the first turn in 8th edition, and a unit activation system would really balance it out. I agree. I was disappointed when I saw that 8th ed still stuck with the same system. My favorite activation system is something like Bolt Action, where you draw at random a chit/die/card that corresponds to a player.